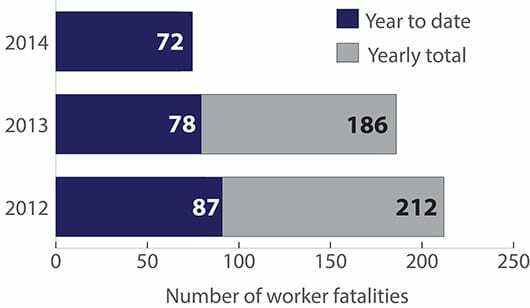 As at 22 May 2014, 68 Australian workers have been killed while at work. The number of worker deaths listed on this page is based on initial media reports and is only a preliminary estimate for the number of people killed. Work-related status cannot be confirmed until the death is investigated by the appropriate authority. Once this has occurred, it is reported in Safe Work Australia’s Monthly Notifiable Fatality reports and Work-related Traumatic Injury Fatalities reports.